Ok, so I’m obsessed with this enchilada recipe. It’s pretty basic but because of that you can do SO much with it! I’ve made it with plain chicken, smoked chicken, lots of different cheeses, and it’s delicious every time. Place chicken in a pot and add just enough water to cover, bring to a boil, then lower heat and simmer for 15-20 min (or if you already have chicken cooked you can use that! Like I said, you can do a lot with this recipe so chicken cooked differently is a-ok). Once the chicken is cooked let it cool off and shred it. If you are using cilantro, you will want to throw the salsa, cilantro, and 1/2 cup of sour cream or Greek yogurt into a blender or food processor and purée it until it’s all well mixed. If you don’t use cilantro you can just mix the Greek yogurt/sour cream and salsa in a bowl. Once the sauce is all mixed up, transfer it to a sauce pan and simmer until slightly thickened (10-12 min). Then add the remaining 1/2 cup of Greek yogurt/sour cream and remove from heat. 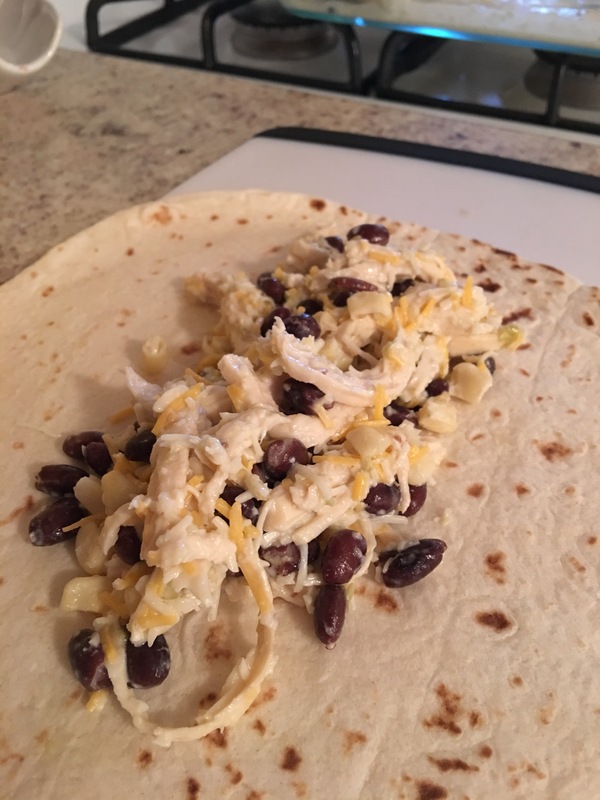 In the same bowl you mixed your sauce, or a new one if you prefer, mix the corn, beans, 1 cup of cheese, and 1/2 cup of sauce with your shredded chicken. Spread approx 1 cup of sauce in a 9×13 baking dish. Roll up your enchiladas (it’s about 1/2 a cup of the filling in each tortilla) and place them in the baking dish seam side down. Top them with the remaining sauce and cheese. Bake until bubbling and beginning to brown, about 15-20 min. And viola! Get ready to feast! This is the best photo I could get after they came out of the oven..couldn’t even wait to take a picture, we had to dig in right away! 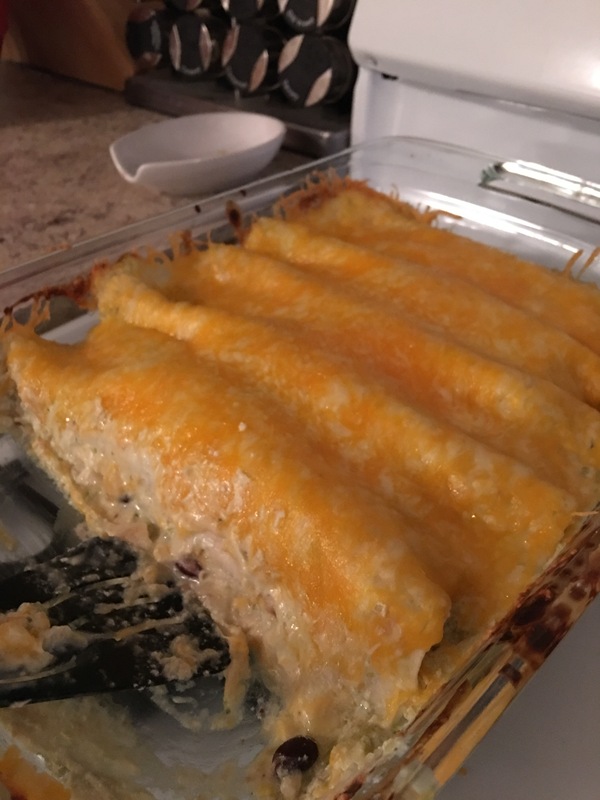 I hope you all enjoy these enchiladas as much as we do, and if you try them out let me know what you think and what (if any) changes you made to the recipe! Previous Previous post: We made it to Silver Lake!